The total fees of the School is € 1200 per participant. It covers all costs except travel. (1) Students will have to arrive on the Sunday 18th August and leave on the Saturday 31st of August 2013. The school (tuition) will take place on the new campus of the University of Cyprus. This address is given for information only. Participants will take the daily CSC bus to and from the University Campus. Participants will be accommodated in the Hilton Cyprus situated in the centre of Nicosia. Rooms are provided with towel, hair dryer and iron. Facilities include outdoor and indoor swimming pool, tennis courts, fitness, shops and vast lobbies. Participants should reach the Hilton Cyprus for on-site registration during the afternoon or early evening of Sunday, 18th of August 2013. For any late arrival, please inform Fabienne before Sunday 18th August 2013. Participants should note that lunch on the day of arrival (Sunday 18th of August 2013) is not provided, but the dinner is. The School will end on the morning of Saturday 31st August 2013, after breakfast. 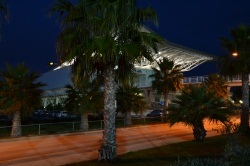 Transportation from both Larnaca and Paphos (150 Km) International Airport is by taxi. - Take the Kapnos Airport Shuttle. Fare: 8€. - Rent a taxi to the centre of Paphos (about €11), and rent a seat in a service taxi to Nicosia (about €14). Accommodation including breakfast and dinners in the Hilton Cyprus from Sunday, 18th of August to the breakfast on Saturday 31st of August 2013. Lunches, and two daily coffee breaks on the campus from Monday 19th of August to Friday 30th of August 2013. Lunch on the day of arrival (Sunday 18th of August 2013) is not provided, but the dinner is. The fee does not include travel expenses from the participants' working place to the Hilton Cyprus Hotel and back. Participants arriving before Sunday evening 18th of August or leaving after Saturday 31th of August a.m. will be entirely on their own: the school will neither arrange for their accommodation nor will cover any cost associated to their extended stay. The actual expenses per student exceed the total fees requested to participants. The difference between the actual cost and the total fee is borne by the school organization. Candidates should ensure that not only have they completed the Web Application Form, but that a signed formal letter of reference (on formal headed paper from the applicant's institute/organization) from their supervisor or professor is uploaded on the registration site by the 1st of May 2013 at the latest. In addition, a certification form must be filled in and signed by the applicant's supervisor or professor (and not by the applicant) and uploaded on the registration site by 1st of May 2013. The selection of the participants will be made by the Selection Advisory Committee and participants will be informed of the outcome of their application by the beginning of June 2013.